Is he a brown person? Oh god, is he Muslim? Please don’t let this guy be Muslim. They all rush to ask these questions, not because of some proud desire to not be religiously- or culturally-associated with such a horrible person, but because they know America’s reaction to violence perpetrated by Muslim, brown, or Middle Eastern people. They know America’s reaction will implicate them, personally. When violence or terrorism is carried out by a brown, Middle Eastern, or Muslim person, mainstream America (especially on the Right) is sure to prominently and often describe him as such. “Muslim” and “Middle Eastern” become a part of the branded moniker used to identify—and market—the individual. 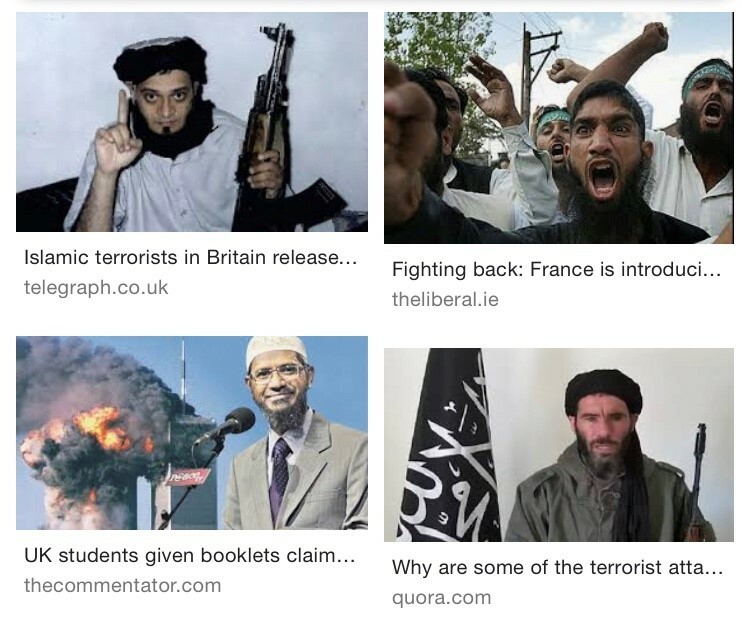 Google image search of and term “Muslim terrorist.” Source, Google. When the terrorist is brown, Middle Eastern, or Muslim, those characteristics become a prominent part of his publicized identity, whether or not the individual personally identified as such. The photos used to portray the individual are cartoonishly violent, meant to stoke a larger fear of the cultural, ethnic, or religious group with which the individual is undoubtedly presumed to be affiliated. What’s more, very little attempt is made to investigate or publicize the individual's mental health history or stability. Beyond this obsession with making certain these characteristics are a part of the official description and analysis of the individual, the media and Americans at-large fixate on those characteristics and automatically associate and blame the larger group with which they presume the individual is affiliated. This is why my friends were so relieved to find out that this particular terrorist was not Muslim or Middle Eastern. Stephen Paddock, perpetrator of 2017 Las Vegas shooting (58 fatalities and 851 injuries), pictured cheerful at a bar with his friend. Source, ABC News. The same media presentation simply does not apply when the terrorist isn’t brown, Middle Eastern, or Muslim. Take Stephen Paddock, perpetrator of the 2017 Las Vegas shooting, for example. If you let the photos alone tell the story, he would appear to be a normal, fun-loving man. You’d never know by the way the media visually presented him to us, that he was responsible for one of the largest solo mass shootings in American history. Visual representations are only one aspect. Descriptions, analysis, and coverage are another. Mere hours after intelligence agencies identified the alleged pipe bomb terrorist as Cesar Sayoc, Jr., an outspoken supporter of President Donald J. Trump, Sayoc’s former lawyer, on national television, referred to Sayoc as “14 years old living in an adult body,” just moments after recounting Sayoc’s history of criminality, violence, and aggression. The lawyer went on to state that, “[Sayoc] doesn’t seem to recognize reality. He lives in a fantasy world. The signs of mental illness are clearly there.” CNN intelligence analysts assumed mental health issues as well. He was described as a loner, unaffiliated with any larger religious or racial group. As I write this, I honestly don’t know much about Sayoc’s cultural, religious, or racial identity. I don’t know his race. I don’t know his religion. But I know he’s not Middle Eastern. I know he’s not brown. I know he’s not Muslim. And I can glean all of this without ever requiring a photo of him. I know this because of the way the news media has presented him to us. 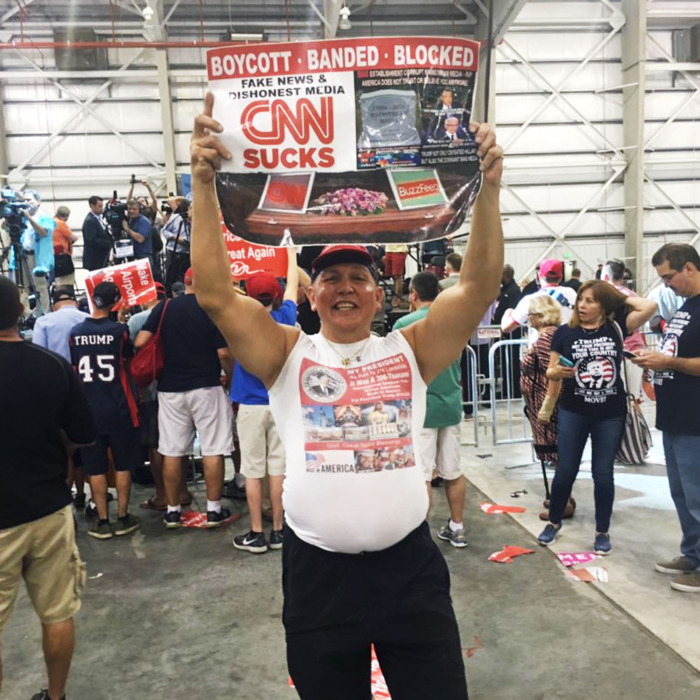 Cesar Seyoc, Jr. at Trump Rally. Source, New York Magazine. Brown people are simply never given the presumptions that their mental health may have played a role in the violence they perpetrated. And they are always presumed to be part of a larger extremist group. This is the script to which we’ve grown accustomed. This is the automatic process, which stems from the racial, cultural, and religious prejudices of the decision-makers within the news media, meant to satiate similar prejudices within the viewing public. This is the reason we’re relieved to find out a terrorist is not Middle Eastern or Muslim: we know those groups will be spared the wholesale hatred and blame—at least this time. Do not take this to mean that, legally, we should treat Sayoc any differently than any other terrorist. If he is, in fact, found guilty of sending the dozen or more pipe bombs, he is by definition, a hateful and violent individual who deserves to be punished to the fullest extent of the law. If appropriate, based on the facts, I hope that the media and law enforcement treat him the way they would treat any other radicalized extremist. I suspect, however, that Sayoc’s radicalization will be traced directly to President Donald J. Trump and the incendiary environment the MAGA movement has created. But that’s a topic for another day.